Authentic European Four Hands Ottomans are reproduced by seasoned artisans to capture the look of Old World craftsmanship. Every delicious detail - carving or ironwork to upholstered, painting or patina - is done by hand. 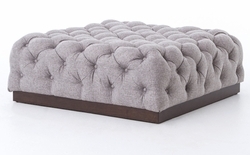 Browse all of our wonderful handcrafted ottomans.